Chris Fernandez, the local election agent for eight Trade Unionist and Socialist Coalition (TUSC) candidates at the 2016 council elections in Derby, was yesterday sentenced to 15 months imprisonment for charges of electoral fraud. After a two-and-a-half week trial in December Chris had been found guilty on 12 out of 14 counts of misleading voters into signing the TUSC candidates' nomination papers. The case made by the Crown Prosecution Service (CPS) was that a significant number of electors had signed believing that they were backing a petition against the closure of Derby's Moorways swimming pool and not a local election nomination form. 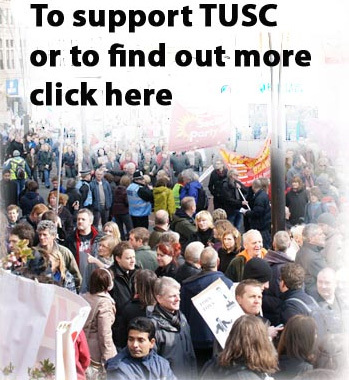 The Trade Unionist and Socialist Coalition (TUSC) national steering committee today confirmed that the left-wing alliance will not be standing candidates in the general election. TUSC, co-founded by the late Bob Crow in 2010, was the sixth-biggest party on the ballot paper on May 7th 2015, with its general election and council candidates polling 118,125 votes. This time, however, TUSC will be working all out to try and get Jeremy Corbyn into Number Ten on June 8th. "Ever since Jeremy launched his leadership bid in 2015 TUSC has been determined to support him against Tory and Blairite attacks and build the anti-austerity struggle that lay behind his success. The Trade Unionist and Socialist Coalition (TUSC) national chairperson, Dave Nellist, today welcomed the general election called for June 8th as a chance to drive out the Tory government and reverse their vicious austerity agenda. Dave, a Labour MP from 1983-1992, urged his former backbench colleague Jeremy Corbyn to fight the election on clear socialist policies, pledging to support him in resisting the efforts of Blairite MPs to water down the anti-austerity platform which won Jeremy his Labour leadership victories. "According to the annual Sunday Times Rich List survey the wealth of the thousand richest people in Britain has more than doubled since the Tories came to power in 2010", said Dave. "Levying capital gains tax even just on that increased wealth would alone bring in over Â£80 billion for extra public spending. Austerity is 'working' only for the rich and a new course is needed. The Trade Unionist and Socialist Coalition (TUSC) today added its support to an appeal to Jeremy Corbyn by socialist members of the Irish parliament (TeachtaÃ­ DÃ¡la - TDs) to use the Brexit negotiations as an opportunity for an international anti-austerity campaign. The TDs, members of the Anti-Austerity Alliance-People Before Profit (AAA-PBP) group in the Irish parliament (DÃ¡il Ã‰ireann), had written to Jeremy Corbyn earlier this year. They suggested that a proposed European conference hosted by the Labour leader should be used to discuss how to "promote the case for a fundamental recasting of European relationships, encompassing your stated opposition to EU-driven neo-liberalism and austerity and your support for public ownership" (see http://www.tusc.org.uk/txt/396.pdf for the full text). The Trade Unionist and Socialist Coalition (TUSC) today hailed the 'massive vote of no confidence' in the Tory government expressed by Thursday's EU vote and called for the labour and trade union movement to follow this up by demanding an immediate general election. TUSC, which has been the sixth-biggest presence on ballot papers in elections for the last four years, campaigned for a leave vote in yesterday's poll. With EU referendum campaigning resumed, the Trade Unionist and Socialist Coalition (TUSC) today appealed to broadcast media workers to consider the role that the organisations they work for have played in creating the climate of hate that formed the backdrop to the shocking and horrific murder of Labour MP Jo Cox last Thursday. The Electoral Commission was also criticised by the left-wing exit group for its decision early in the EU campaign to give political authority to the reactionary Vote Leave organisation, led by Tory Brexiters Boris Johnson, Michael Gove et al, when it was under no legal obligation to grant 'official designation' status - and millions of pounds of public funds - to any campaign group at all. The Trade Unionist and Socialist Coalition (TUSC) today appealed to shadow chancellor John McDonnell to explicitly repudiate Alistair Darling's support for George Osborne's threat of an emergency austerity budget in the event of a vote to leave the EU. This followed the appearance by the former Labour chancellor, Lord Darling, in support of George Osborne's scare threat that tax increases and spending cuts of Â£30bn would have to be rapidly agreed by parliament if an EU exit vote won on June 23rd. Together they produced an 'illustrative' list of new cuts including Â£2.5bn to the NHS, Â£1.15bn in education, and cuts of more than 5% from transport and local government. The Trade Unionist and Socialist Coalition (TUSC), which is supporting an exit vote in the EU referendum, today added its voice to the protest over the voting pack issued by Bristol city council for postal voters in June's ballot. The council has been distributing a how-to-vote guide to postal voters with pictorial instructions that show a pencil hovering over the Remain box on the ballot paper (see http://www.bbc.co.uk/news/uk-politics-36411509). At the very least the graphic is not a neutral depiction of the mechanics of voting. The Trade Unionist and Socialist Coalition (TUSC), one of three EU exit organisations that applied for recognition from the Electoral Commission to be the official Leave campaign, today made an appeal to media workers for fair coverage of the socialist case against the EU in the run-up to the June referendum. A press release was issued but also, in an attempt to speak directly to journalists and other workers, a number of media workplaces were leafletted by TUSC members. The Trade Unionist and Socialist Coalition (TUSC) national steering committee has agreed to formally complain to the Returning Officers of Bristol and Liverpool councils for what can only be described as political censorship of the TUSC candidates contesting the Mayoral elections in the two cities on May 5th. Candidates in Mayoral contests are entitled to have an election address printed in a booklet distributed to every elector. There are rules about the content of the address, that it should not be used for commercial gain or that it must not contain "any material referring to any other candidate". The national steering committee of the Trade Unionist and Socialist Coalition (TUSC), one of three EU exit organisations that applied for recognition from the Electoral Commission to be the official Leave campaign, met yesterday to discuss its response to last week's decision by the Commission to give the Tory-dominated Vote Leave group official designation status. The Trade Unionist and Socialist Coalition (TUSC), one of three EU exit organisations that applied for recognition from the Electoral Commission to be the official Leave campaign, today accused the Commission of "bowing to political pressure" in giving the Tory-dominated Vote Leave group official designation status. TUSC had submitted what the BBC called a 'surprise bid' to be the designated Leave campaign in June's EU referendum (see http://www.bbc.co.uk/news/uk-politics-eu-referendum-35941945) against the Tory and UKIP dominated exit campaigns, Vote Leave and Grassroots Out - but said it was "not surprised" that the Electoral Commission has gone along with the government's preference for a safe, pro-establishment Leave campaign. The Trade Unionist and Socialist Coalition (TUSC) today followed up what the BBC called a 'surprise bid' to be the official Leave campaign in June's EU referendum (see http://www.bbc.co.uk/news/uk-politics-eu-referendum-35941945) by challenging the Tory and UKIP dominated exit campaigns - Vote Leave and Grassroots Out - to a public debate. The Trade Unionist and Socialist Coalition (TUSC) has responded to the Comprehensive Public Spending Review by calling on Labour-controlled councils to come together and resist George Osborne's latest cuts to vital local public services. "If Osborne can be forced into a U-turn on his tax credit cuts by the House of Lords he can be made to retreat on his new draconian cuts to local council funding. But it will need a determined fight by Labour councillors". The Trade Unionist and Socialist Coalition (TUSC) national chairperson Dave Nellist has warmly welcomed Jeremy Corbyn's decisive victory in the Labour leadership contest. "Jeremy's clear victory will now give a voice to the depth of anti-austerity feeling in Britain. He has clearly inspired huge numbers, particularly young people, with his call for free education, public ownership of rail and energy, and for councils to stand together in opposition to government cuts. The Trade Unionist and Socialist Coalition (TUSC) national steering committee has today endorsed the Manifesto for Education produced by the largest teachers' union in England and Wales, the National Union of Teachers (NUT). At the same time it was confirmed that four members of the union's national executive committee (NEC) will be standing as TUSC candidates in May's elections. The Con-Dem Government has damaged children's education. Their determination to open free schools and academies has left a fragmented and divided education system. Their attacks on pay, conditions and pensions have demoralised school staff. Excessive testing and divisive league tables have driven enjoyment out of education for staff and students alike. Children, families and school staff need these damaging policies to be reversed. Shamefully, the Labour Party has given no indication that it would do so. David Blunkett's policy review made clear that "academies are here to stay". Shadow Education secretary Tristram Hunt has joined the Tories in blaming teachers for the problems caused by cuts, poverty and divisive education policies. This edition of Russia Today's Going Underground, published on youtube on 28 Jan 2015, covered the 'Rise of UK's Syriza' - a reference to the Trade Unionist and Socialist Coalition (TUSC). This short edit shows presenter Afshin Rattansi's interview with Clive Heemskerk, TUSC's national election agent. The leader of the Trade Unionist and Socialist Coalition (TUSC), former Coventry MP Dave Nellist, has today called for government intervention to save City Link jobs, saying the company should be nationalised. The courier firm, City Link, whose headquarters are in Coventry, went into administration on Christmas Day putting thousands of jobs at risk.